In my last post, I showed how Cepheid variables allow us measure distances to distant stars and even to other galaxies. However, there is a limit to how far we can measure using Cepheids. To measure the distance to the farthest galaxies, it takes a standard candle much brighter than a Cepheid. It takes a supernova. In the early 20th century, Walter Baade and Fritz Zwicky were studying novae that seemed much more energetic than most. During a 1931 lecture, Zwicky coined the term ‘supernova’ for an event that releases as much energy at once as the sun does over 10 million years. 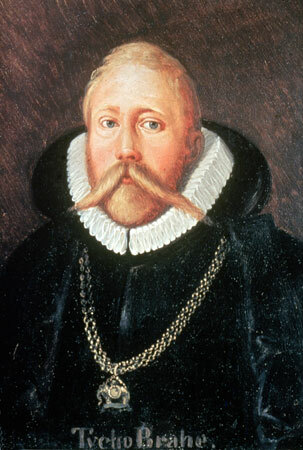 (As it turns out, Brahe had observed a supernova, not a mere nova). We now know that novae and one type of supernova occur due to white dwarfs accreting matter onto their surfaces. All stars roughly as massive as our sun end up as white dwarfs. In a white dwarf, the nuclear fusion which normally powers the star and resists gravitational collapse has ceased. Yet, the white dwarf fails to collapse completely because of its extreme density; a white dwarf has approximately the sun’s mass in approximately the Earth’s volume. Thus, the matter is so dense that any further compression would force multiple electrons into the same quantum state–which is disallowed according to the Pauli exclusion principle. The resulting resistance to further compression becomes a force known as electron degeneracy pressure. Occasionally, a white dwarf gravitationally bound to another star gains mass from that star. Every star has a Roche lobe, which is the region of space in which all orbiting material remains bound to the star. If, during stellar evolution, the companion of a white dwarf expands beyond its Roche lobe, some of its material, having escaped its gravity, can fall onto the white dwarf. On the white dwarf’s surface, in-falling material, mostly hydrogen and helium, can attain temperatures and pressures sufficient to start nuclear fusion. The resulting fusion of hydrogen into helium and helium into carbon and oxygen releases so much energy that the white dwarf suddenly becomes up to 50,000 times more luminous. The white dwarf has gone nova. As dramatic as a nova explosion is, however, the material ejected is typically only about 1/10,000 of the sun’s mass–much less than the mass of the white dwarf. Therefore, a particular star can go nova on many different occasions. recorded by both Chinese and Islamic Astronomers. There is a limit as to how much mass electron degeneracy pressure can support. A white dwarf must have a mass less than 1.38 solar masses (the Chandrasekhar limit) to remain stable. If a white dwarf in the scenario described above accretes enough mass to surpass that limit, the entire star becomes unstable, resulting in a explosion called a type Ia supernova. Unlike a nova, a supernova cannot recur because the star has been destroyed. ‘Type I’ refers to scheme established by Rudolph Minkowski and Fritz Zwicky which classifies supernovae based on their spectra. Spectra of type II supernovae indicate the presence of hydrogen. These are supernovae in which a star much more massive than our sun collapses and explodes, skipping a white dwarf phase altogether. Type Ib and Ic supernovae occur when very massive stars which have lost hydrogen explode. They lack hydrogen in their spectra, which puts them in type I, but they are more similar to type II supernovae in how they form. Type Ia supernovae, in which white dwarfs explode, are the most interesting for our purposes here. 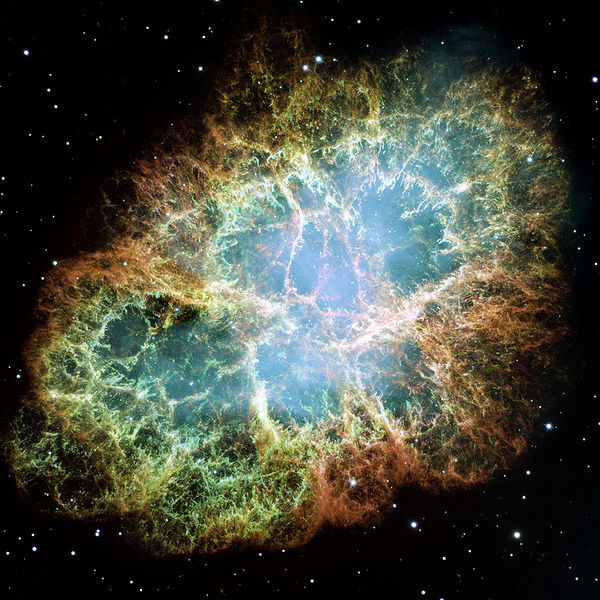 In every type Ia supernova, then, the same amount of mass (about 1.38 solar masses) is exploding. As a result, each type Ia supernova has the same intrinsic brightness, or luminosity. Recognizing this, Walter Baade proposed using them as standard candles back in 1938. Further, such a supernova is brilliant, rivaling the brightness of an entire galaxy, and therefore visible over much longer distances than Cepheids. For these two reasons, type Ia supernovae are excellent standard candles for measuring distances to galaxies containing them. With type Ia supernovae, we can measure distances many hundreds of millions of parsecs away, as compared to only about 29 million parsecs for Cepheids. There are two caveats, however. First, astronomers using the Mauna Kea Observatory in Hawaii in 2003 observed an atypical type Ia supernova, which they dubbed the ‘Champagne Supernova’ (nicknamed after the Oasis song of 1996). Somehow, this white dwarf managed two solar masses before exploding (rather than 1.38). Some suspect that an unusually fast rotation may have allowed the extra mass to accrete, but this is an area of ongoing research–a reminder that whenever we think we have something figured out, nature can surprise us. Second, although measruing galaxies hundreds of millions of parsecs away is a great achievement, we estimate that the observable universe is 28 billion parsecs across. There are still other tools we must use to measure even more distant wonders. Can’t see the video? Check out this video on Supernovas by clicking here. Next Post What in the World is THAT!!? ?